As a privately-owned company, Mid-Illinois Companies believes in offering exceptional customer service and craftsmanship for all your construction needs. We understand how important of an investment your building can be. This is why fireproofing should be at the forefront of your mind. 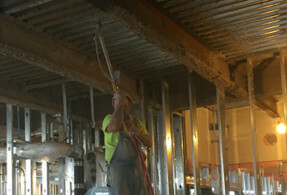 To efficiently fireproof a newly-constructed building, you should consider intumescent fireproofing in Peoria, IL. In fact, you can trust our experienced team to handle the task to the best of our abilities, every time. 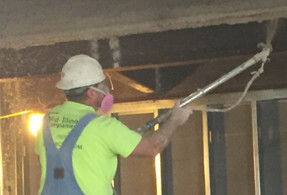 Intumescent fireproofing in Peoria, IL is a useful way to prevent a surprise fire from destroying your new piece of property. For passive fire-resistance, we apply the intumescent coating often referred to as intumescent paint. Our professionals apply the material to key structural areas. Therefore, your property is fireproofed in an effective and aesthetically pleasing way. 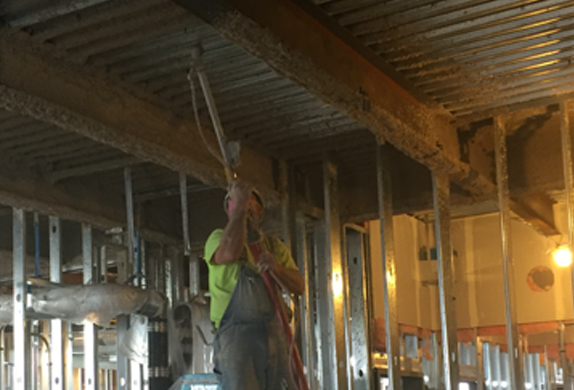 Some intumescent fireproofing products are capable of expanding, once applied, to 100 times their original thickness. As the coating expands, it will become less dense, making it an efficient insulator that prevents high temperatures from damaging the overall structural integrity of a building. 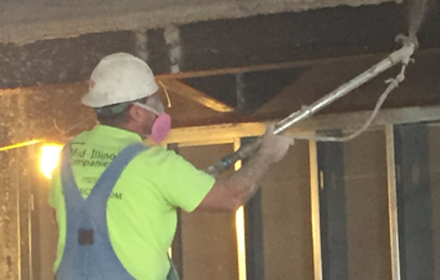 A coating of suspended chemicals makes up intumescent fireproofing in Peoria, IL. When exposed to heat, the surface begins to soften, which allows the chemicals to interact with the heat of a fire. As a result, the coating itself will expand, protecting the initial structural material from the flames. After our coating process, your building material will be safe from the burning flames. Fire will destroy the paint-like coating. This coating essentially protects the entire structure from being consumed by the fire. To take advantage of intumescent fireproofing in Peoria, IL, contact Mid-Illinois Companies today by calling (309) 674-0717. We would be happy to answer any questions you may have at this time, so please do not hesitate to call!